There are many options when it comes to deciding what size your concrete patio should be. Should you design one large patio or several smaller ones? Your goal should be to create an outside living area that, in effect, is an extension of your home. This means you should first determine what uses your patio will serve (see tips for patio shape and layout). 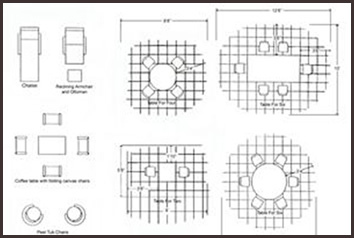 You can use this handy guideline of standard dimensions for determining how much space to reserve for dining and lounging areas. Most landscape designers will agree that several smaller patio areas are more aesthetically appealing. Consider this: When you're hosting a party, isn't it true that most people congregate in small groups? Your patio should reflect how it will be used. Creating inviting areas where a few people can gather to chat or dine is a great way to approach the design of your patio. If you have just enough space to accommodate a two-seater bistro table, a standard size for your patio should be 6-7 feet in diameter. This leaves enough room for the table and chairs and for easy walking to, from, or past the seating area. Depending upon the size of your dining table and chairs, the minimum patio size to accommodate a 48” round table with room to walk around the space, is 12-14 feet. This allows enough room for chairs to be pulled out for comfortable seating while still allowing traffic to flow around and behind. If you want enough room to incorporate deep seated patio furniture, such as a couch, or chairs with ottomans, or coffee table styling, then you'll want to design a patio approximately 16-18 feet in diameter. A good rule of thumb is to leave a 3 foot pathway clear of furniture to allow for good traffic flow.